Our creativity is something that cannot be measured. Just like the saying Art is in the eye of the beholder. This becomes even more true as we begin to unlock our own creativity. We are no longer searching for external validation that something is good enough. Our creativity gives us license to explore. Permission to make mistakes. Those mistakes if given the chance turn into a masterpiece. 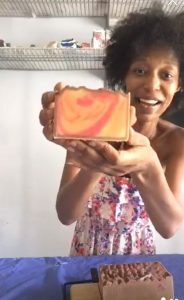 Cold Process Soap often lends itself to this creativity. We never truly know what will happen when we unmold a batch of soap. We use our knowledge and experiences to guide us and creativity to massage where necessary. Sometimes it works out well, sometimes our projects exceed our expectations. Many times the magic happens when we choose which mistakes are acceptable works of art. Have you every had a disaster with your soap recipes that turned into a masterpiece?